Searching for some popular quotes about emptiness. If yes, now you don't need to search for them anymore. As here i have compiled down some of the popular quotes on emptiness and feeling lonely. Just hope you will like the quote compilation and able to find words to express your feelings. It is curious how our thoughts seem to come out of the emptiness they are trying to fill. 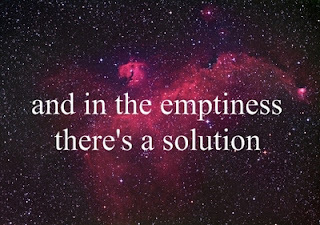 It is beautiful, it is endless, it is full and yet seems empty. It hurts us. The usefulness of the cup, is its emptiness. Person who fills his inner emptiness with positive opinions of surrounding people is like a person who has to eat hay because of starvation. I decided I would fill the emptiness in me with God and with paint. Nothing has an unlikely quality. It is heavy. For a long time now my heart has had its shutters closed, its steps deserted, formerly a tumultuous hotel, but now empty and echoing like a great empty tomb. No emptiness in universe, love permeates everything. Feeling empty may be a sign of modern times, and a natural evolution of our needs. Empty packets of hot sauce remind me of the love I used to have for her. Now all I’m left with is this yummy taco. It is the empty seats that listen most raptly. This was the truth at the core of my existence: this yawning emptiness, scantily clad in rage. It had been there all along. If the mind is empty, it is always ready for anything; it is open to everything. In the beginner’s mind there are many possibilities, in the expert’s mind there are few. He suddenly felt nothing, or rather Nothing, a pre-tornadic stillness of zero sensation, as if he were the very space he occupied. Tell me what is this thing that i feel like I'm missing and why can't I let it go.